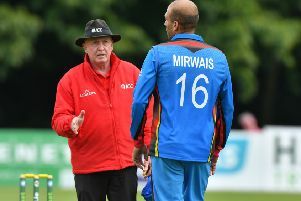 Tim Murtagh’s new ball burst took Ireland to the brink of an innings victory, but a determined rear-guard action late in the evening by Namibia ensured their InterContinental Cup game went into a final day in Windhoek. Middlesex seamer Murtagh dismissed Xander Pitchers (0), Stephan Baard (1), and Raymond van Schoor (1) to leave the Namibian second innings in tatters. Craig Young also accounted for Ya France (6) as Namibia slumped to 12 for 4 resuming 319 runs behind Ireland’s huge total of 570 for 6 declared. First innings top scorer JP Kotze (48) again held up the Irish charge, as he and Sarel Burger (34) added 68 for the 5th wicket. Paul Stirling (1-17) broke the stubborn stand when he had Burger caught behind by Niall O’Brien. Murtagh then returned to have Kotze caught at short-midwicket by George Dockrell. His figures at that stage were 4 for 7 in 8 overs. Dockrell then claimed the wicket of the experienced Gerrie Snyman (31) and at 130 for 7, it looked as if the victory would be achieved with three days. However the Namibian late order rallied with Zac Green (22*) and JJ Smit (21*) seeing their side through to the end of the day, batting 18 overs in total before bad light took the teams off the field during the extra 30 minutes claimed by the Irish. Earlier resuming on 402 for 4, Ireland had lost Gary Wilson (25) early, but skipper William Porterfield and Stuart Poynter (33) added a further 56. Porterfield looked destined to follow Ed Joyce and Eoin Morgan into the double hundred club, but after passing his highest first-class score was dismissed for 186. The experienced pair of John Mooney (53*) and Kevin O’Brien (45*) added an unbroken 97 for the 7th wicket extending the Irish lead to 319 before the declaration came in the early afternoon. Ireland will be confident of wrapping up the innings win which would see them on top of the table with maximum points from their opening two games in the competition.